The most impactful use of 3D technology in the real world comes from the medical field. Processes involving the combination of 3D scanning, 3D modeling and 3D printing or digital fabrication have increasingly helped surgeons visualize and practice complicated surgery on patient-specific models, which are then used for teaching purposes. Medical prosthetics have dramatically decreased in price while significantly improving in aesthetic satisfaction. Examples such as polyetherketoneketone (PEKK) printed cranial implants, artificial ribs printed from titanium alloys and the proliferation of easily 3D printed hands from organizations like e-NABLE are evidence that there are substantial benefits produced by the convergence of 3D technology and the medical field. A recent example of a medical 3D technology application involved 5-year-old Mia Gonzalez, who was diagnosed with a double aortic arch. The rare heart malformation disrupted Mia’s breathing due to the constriction produced by a vascular ring surrounding and constricting her trachea and esophagus. This condition is often mistaken for asthma since symptoms appear similar. Her life was at risk, and only a very difficult surgery could repair her heart. Mia holding the 3D printed model of her heart that surgeons used to visualize and plan her surgery. Image courtesy of Stratasys. The cardiovascular surgery team at Nicklaus Children’s Hospital was able to amplify the effectiveness of their surgery planning process by 3D printing an exact model of Mia’s heart to determine which area of the arch should be repaired to ensure the best possible outcome. Standard models of the human heart do not provide much help when surgeons are planning for patients who require difficult heart surgeries. In cases like Mia’s, having as much detail as possible about her heart and the double aortic arch was crucial. 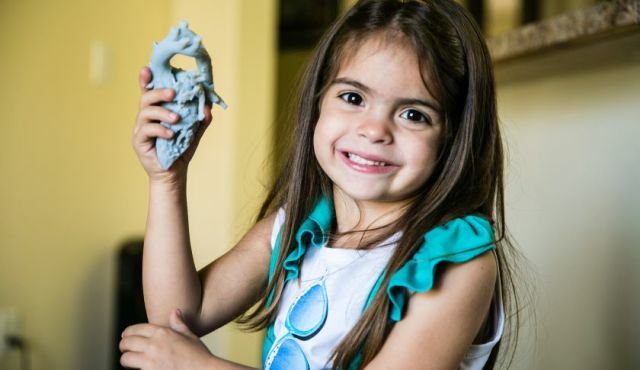 Using advanced imaging techniques like MRIs and CT scans, the doctors at Nicklaus Children’s Hospital can easily feed the information they obtain to Stratasys 3D printers to print replicas of organs, like Mia’s, to know exactly how to approach the pending surgery and help improve the probability of a successful recovery. Mia’s surgery was extremely successful thanks to the 3D model that allowed doctors to visualize in fine detail the task at hand and allowed Dr. Burke to scrutinize areas to be operated on during surgery before beginning to operate. Mia recovered in only two months and can now live a happy, healthy life. Advanced RP, Inc., a Stratasys subsidiary, produced the anatomical model for surgeons at Nicklaus Children’s Hospital using a Stratasys Objet500 Connex3 multi-material 3D printer. These 3D models have made such a difference in recent surgeries at Nicklaus Children’s Hospital that they have decided to install their own 3D printer rather than outsourcing to Advanced RP. Nicklaus Children’s Hospital is a world-renowned pediatric care facility and one of several medical institutions that Stratasys has recently partnered with—a refreshing indicator of the positive impact 3D technology is making on medical imaging, prosthetics and surgery.